Discount Dumpster services West Valley City and surrounding Salt Lake City area with waste containers. When choosing the size you need for a project be sure to understand the different dimensions each container provides. When you utilize our services you are getting set prices from the start. You simply call our office to book an order and we will handle the rest. We serve the city of West Valley City with all things trash. Roll Off Dumpster rentals are simple to utilize and available for use in many different sizes. Deliveries can be scheduled for next day or weeks down the road. Discount Dumpster is environmentally friendly so that we have a solution for all things waste management. Rent an affordable waste disposal solution with a roll off container today. Great for cleaning out the attic, garage, or basement. Small dumpster that fits in tight areas. Gives the ability to haul small amounts of construction debris. Great use for roofing material and larger remodeling projects. Kitchen and/or bathroom remodels. Easily get rid of household junk and lighter construction material. Ideal for home renovations and fix and flips. 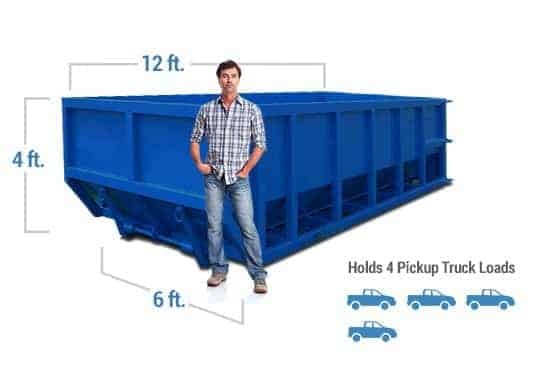 This dumpster provides amble space to haul all of your junk and construction debris in one easy to use space. Large scale clean ups are no match. Looking for an affordable dumpster rental? Discount Dumpster has minimized our margins so that each customer is able to save. We have assemble a great dumpster rental staff in order to deliver the best results. Have a positive waste removal experience when you rent with us. Call a customer service Representative to get all of your dumpster rental questions answered. We will walk you through the process so that you are comfortable with your experience. Discount Dumpster provides flat rates on all dumpsters so that there are no hidden fees. We work with skilled drivers so that each haul is delivered exactly where you need it. The best part about it is that when we set a dumpster you do not need to be onsite. Be sure the placement is clear of debris and not blocked. You are able to go to work for the day and come back home to a dumpster ready to go. With the ability to deliver in most neighborhoods a permit may or may not be necessary. Check with your HOA prior to placing a dumpster on the street. West Valley City Planning and Permitting also has regulations around placing dumpsters on the street in high traffic areas. A permit may be purchased from the inspection division. The best way to seamlessly rent a dumpster is to place it on your driveway. Don’t worry..concrete will not crack.